David Greco is the 2013 Trofeo di Bari champion in the Italian Formula Promotion series. Driving the SRZ Motorsport Formula Predator, PC008, Greco won the series title with a dominant final weekend, winning both races at Varano—not only in the Trofeo di Bari class, but taking advantage of the rain for outright wins over the faster PC010 cars. David Greco has raced cars in the past, and over the last few years has maintained his edge through simulation racing. Simulation racing is proving to be a valid approach to both driver training and evaluation, as David has proven in 2013 and in past seasons. 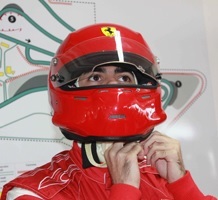 In 2011, Greco won a Ferrari Formula One online simulation racing contest that earned him a trip to Fiorano—Ferrari’s private test track in Maranello—to drive a Formula Abarth car under the gaze of Stefano Domenicali. In 2005, Greco made several appearances in the Skip Barber National Championship series in the United States, earning a podium during his first race weekend, and a front row start just weeks later. From 1999 to 2002, David raced karts in and around Sao Paulo, Brazil, and immediately after turning 16 made his car racing debut in Brazilian Formula Ford at the famous Interlagos Circuit. He has also had seat time in Formula 3, Formula Palmer Audi, Formula Renault 2.0, and Formula Ford 1600 cars in the last decade, each time demonstrating that additional time behind the wheel could lead to excellent results. For 2014 David looks to continue racing, with perhaps a move up to a higher-level, faster series. To make this move, he will require financial backing. To learn more about David’s plans for 2014 and his sponsorship needs, please visit the Sponsors page, or send him an email.